Famous Italian Film Composer, Ennio Morricone may open the 2018 season of Black Sea Arena on May 19. Negotiations with the production group of Ennio Morricone are at the final stage. “In a few days we will have all details that will be released at a special press conference. Negotiations are underway at this stage. It is a fact that the arrival of such magnificent musician, who does not frequently hold tours around the world, will be very important for Georgia, “ said Ani Kavlelishvili, director of Black Sea Arena. The Black Sea Arena signed a contract with General Entertainment Associates (GEA), the Dutch company that organizes Morricone's concerts, at a cost of EUR 250,000. One of GEA’s most prominent partnerships at the moment is with the Academy Award winning epic film composer Ennio Morricone. 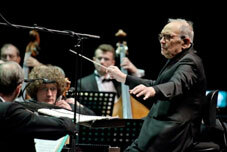 GEA has produced a live concert production around Maestro Morricone with an extended symphonic orchestra. The event will be held within the frames of “Check in Georgia”. Black Sea Arena is becoming more popular every year. Since its opening, the venue has already hosted internationally celebrated figures including the Scorpions, Christina Aguilera, Vanessa Mae, and Aerosmith. Ennio Morricone has sold over 70 million records worldwide. In 2007, he received the Academy Honorary Award "for his magnificent and multifaceted contributions to the art of film music." He has been six times nominated for Oscars. In 2016, Morricone received his first Academy Award for his score to Quentin Tarantino's film The Hateful Eight (2015). His other achievements include three Grammy Awards, three Golden Globes, six BAFTAs, ten David di Donatello, eleven Nastro d'Argento, two European Film Awards, the Golden Lion Honorary Award and the Polar Music Prize in 2010.